The marketing world has changed over the years. Originally, cold calling was more successful. But today, the chance of getting a sale from old sales methods is remarkably low. So, how do you increase the quality of your leads? As an inbound marketing agency, we specialise in creating and setting up inbound strategies for businesses which produce high quality leads. We've collected some of the best (and easy) steps you can incorporate into your own marketing to help you gain the best leads for your business. Creating a contact form on your website is one of the easiest ways to get leads via your website. You can improve the quality of those leads by adding 'required' fields. This means the online visitor has to fill out the required* sections. To get better quality leads, you need to ensure all important form fields are filled out. Getting a person's full name and their occupation, are two important pieces of information that can improve the quality of your leads. All you have to do to make your form fields required is to enter some coding into your form CSS. Remember to use this coding sparingly. Long contact forms are time consuming and deter people from giving their information. Only use 'required' fields on information you definitely need to help you improve the quality of your leads. Getting a person's work email can be more fruitful than asking for their personal email address. Especially if you're a B2B company. A business email address gives you a company name. You can create marketing strategies that engage with the needs of that business. To show you're the right company for them. Employees at work regularly check their work emails, more than their personal accounts, you're likely to get more response from a work email than a personal one. If you're regularly getting leads via your website that's great news. But how many of those leads are your actual ideal customers? The best way to get high quality leads is to create marketing strategies that focus on your ideal persona. What is an ideal buyer persona? The methodology behind the concept of inbound marketing is how you should be marketing to ideal buyer personas. These personas are your target market. You don't want to waste time marketing to people who aren't interested in your business. You should be focusing all your marketing funds towards the people who are your potential customers. Create your own buyer persona profiles to help you get a better understanding of your target audience so you can improve and focus your marketing towards them. In return, you can receive higher quality leads. Your call-to-actions need to be relevant to your target market. All your content should be written to engage with your ideal buyer personas. This is the same with your call-to-actions. You don't want everyone signing up for your free eBook or weekly emails, you only want your ideal customers. Create content and CTAs that will engage with the pain points of your ideal personas. Once you've created your own profiles of your different buyer personas, you'll be able to create content that will best engage with their needs. You should regularly go through your list of new leads so you can sift out the time wasters. It's a waste of time to market to people who will never be interested in what you have to offer. You'll likely get competitors signing up for your emails, you can manually remove them from your email database or CRM. Consider the buyer's journey when creating your marketing strategies. The buyer's journey describes the process most buyers go through before making a purchase. Awareness: the buyer is aware they have a problem and is searching for more information. Consideration: the buyer is considering their options and looking for the best solution. Decision: the buyer is ready to buy. Understanding the buyer's journey helps you determine when your leads are ready to be contacted or they're ready to buy. Today's buyers don't want to be nagged or feel like they're being hassled. Following the buyer's journey lets you map the journey of your potential customer. In each CTA you create along the buyer's journey, you should ask for more information in your contact forms. As people move further along in their buyer journey, they are more likely to give more information because they've almost reached the decision to buy. The more information you have on a lead, the higher quality the lead is. Lead scoring ranks your leads on 'certain factors' so you will know when they're a marketing qualified lead. In HubSpot, you can determine what these certain factors are. You can create a criteria of what you expect a lead to have when they're ready to be approached by a sales team. When you've got a large database of leads, it's time consuming to find out which leads are ready to become customers. A CRM like HubSpot does the work for you, saving time for your sales team and giving them higher quality leads. Inbound marketing helps your ideal customers find you and makes your marketing engaging. Today's customers want businesses to understand their needs. Learn how the inbound methodology works in our FREE downloadable eBook. 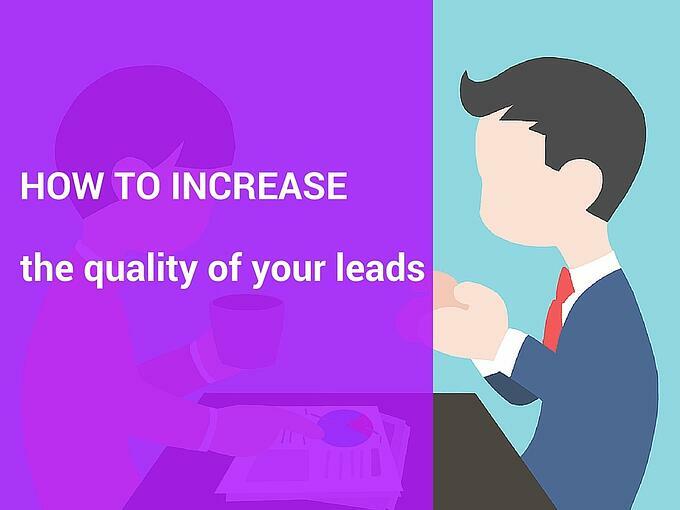 What did you think about our post on 'how to increase the quality of your leads'? Share your thoughts in the comments below.